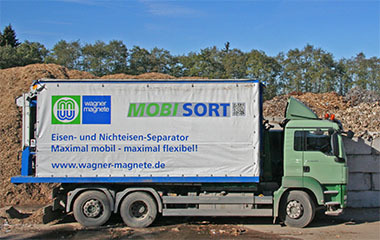 The new mobile Wagner Magnete ferrous- and non-ferrous separation unit is unique due to it's working with of 2000 mm. It ensures highest throughput rates in comparison to other machines. 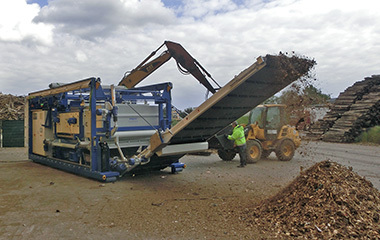 The WAGNER mobile separation unit is the beneficial downstream machine installed after mobile crushers and screens for the removal of metal contamination. The shredded and screened bulk material is divided into fractions of ferrous, non ferrous metals and inert material by the mobile separation unit. 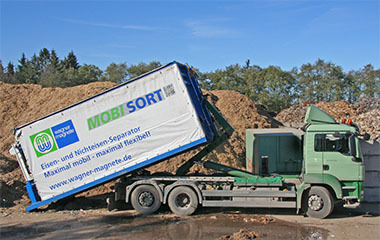 The mobile separation unit is a “Plug and Produce”concept due to its compact design and mobile configuration . After positioning and adjusting the module on site the entire unit is connected to the external power supply by a cable reel – and production can start right away ! Unloading the module on site can be effected by a crane. On each corner of the container is a manual levelling jack for horizontal adjustment. The cable reel with 50.0 m of cable enables the quick connection to the external power supply. After removing the transportation locks the unit is ready for operation The container frame can be equipped with various WAGNER-eddy current separators up to a working width of 2000 mm: series 0428 with concentric rotor, series 0429 with eccentric rotor and also with our new high frequency eddy current separator or the new stainless steel separators. Upstream of the eddy current separator is a high efficiency Neodymium drum that separates ferrous metals thus protecting the eddy current separator. 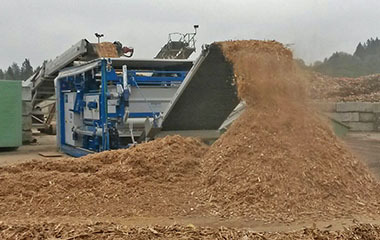 Material feeding is effected by a vibratory feeder of sturdy design. Material discharge is by an inclined belt conveyor. The conveyor is designed to max possible width and driven by a shaft mounted geared motor. The module is outloading the inert material inline with the infeed. The ferrous and non- ferrous metals are discharged by cross belt conveyors. The belts have a discharge length of 3.0 m. They are withdrawn from storage and positioned by motor winches. The electrical control panel with touch screen, built with Siemens-components is safely positioned underneath the vibratory feeder. The single panel controls the entire machine. Displacement at site can easily be done by hook container trucks. The 3000 mm wide container also can be transported on public roads by means of low-loader trailers.